This city system and related concepts are all connected to the computer's hardware. 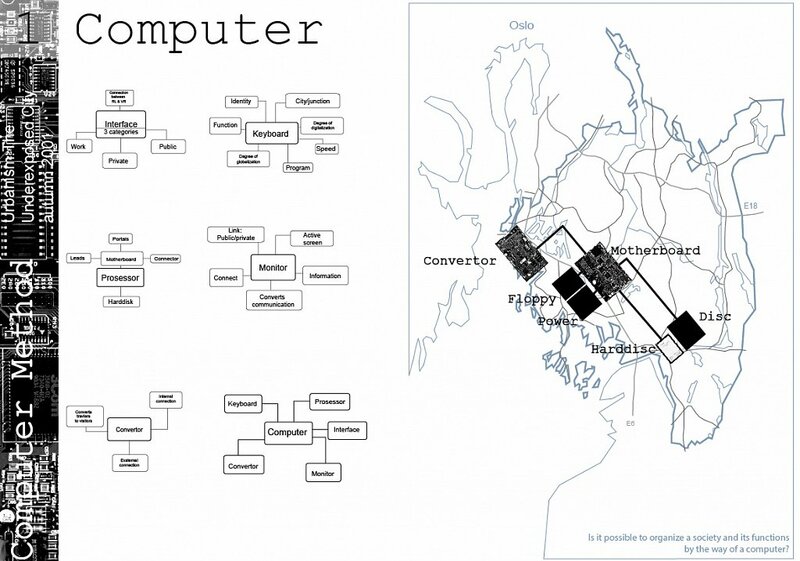 The leads in this systems are the infrastructure which through the connectors; the city-typology links the computer city system. The portals are cities which are nodes and connect different types of infrastructure. The convertor in this system is the international link where travelers are converted to visitors or citizens. This is a system and network of city clusters which consists of cities which are functionally complementary. Its a conceptual and abstract model for creating a city system. 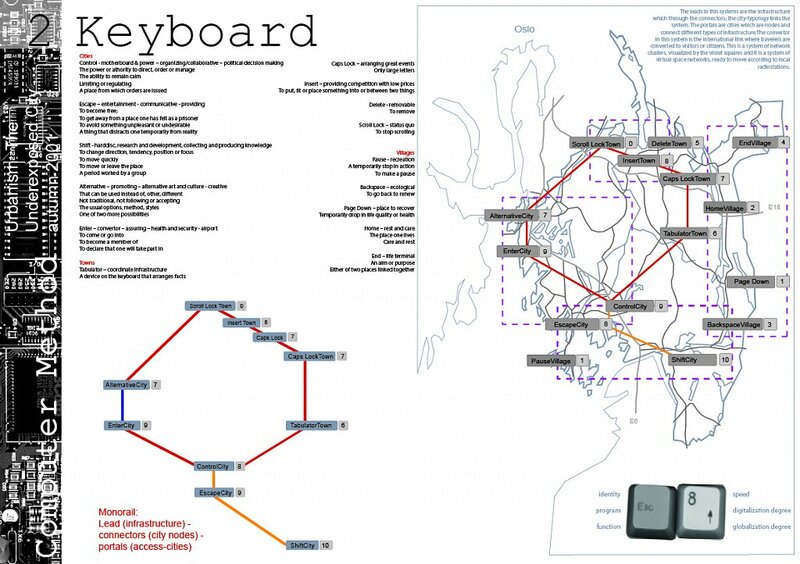 The city names and functions are based on how the buttons on the keyboard are, and they create a suprisingly complemantary, meaningfull and functional typologies of cities. Control City: - motherboard & power – organizing/collaborative – political decision making, the power or athority to direct, order or manage, the ability to remain calm, limiting or regulating, a place from which orders are issued. Escape City: – entertainment - communicative – providing, to become free; to get away from a place one has felt as a prisoner, to avoid something unpleasant or undesirable, a thing that distracts one temporarily from reality. Shift City: - harddisc, research and development, collecting and producing knowledge, to change direction, tendency, position or focus, to move quickly, to move or leave the place, a period worked by a group. Alternative City: – promoting – alternative art and culture – creative, that can be used instead of, other, different, not traditional, not following or accepting, the usual options, method, styles, one of two more possibilities. Enter City: – convertor – assuring – health and security – airport, to come or go into, to become a member of, to declare that one will take part in. Towns Tabulator Town: – coordinate infrastructure, a device on the keyboard that arranges facts. Caps Lock Town: – arranging great events, only large letters. Insert Town: – providing competition with low prices, to put, fit or place something into or between two things. Delete Town: -removable, to remove. Scroll Lock Town: – status quo, to stop scrolling. Villages: Pause Village: – recreation, a temporarily stop in action, to make a pause. Backspace Village: – ecological, to go back to renew. Page Down Village: – place to recover, temporarily drop in life quality or health. Home Village: – rest and care, the place one lives, care and rest. End Village: – life terminal, an aim or purpose, either of two places linked together. (Oxford Dictionary 1995, Oxford University Press). 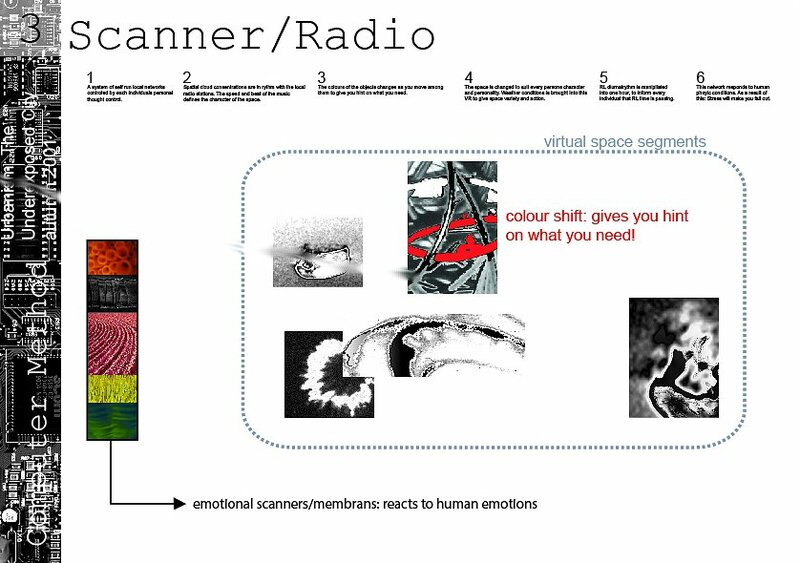 3) Skanner/Radio – Concept: Virtual and spatial networks. These two concepts are based on how a scanner and a radio work. The main intention is to create a virtual cloud of architecture with essential societal functions which all citizens of the computer city system are connected to. Clouds of virtual architecture scanns human beings in its network, which creates a virtual architecture based on the character of the humans online in the cloud system and by music on the radio. This network responds to human physic conditions. As a result of this: Stress will make you fall out. RL diurnalrythm is changed into one hour, to inform every individual that RL time is passing.The space is changed to suit every persons character and personality. Weather conditions is brought into this VR to give space variety and action. The colours of the objects changes as you move among them to give you hints on what you need. Spatial cloud concentrations are in rythm with the local radio stations. The speed and beat of the music defines the character of the space. A system of self run local networks controled by each individuals personal mindsetts. Copyright ©. All rights reserved IART Ingrid Katrine Amundsen, 2007-2019.